Public refrigerated warehousing (PRW) — cold storage — is about much more than large buildings, floor space, storage racks, dimensions, a refrigerated or frozen environment, and thousands of bundled, boxed or cased packages or storage containers on pallets. In a word, it’s about protection. When it comes to food and food ingredients, PRW is the business of protecting and maintaining the food cold-chain, protecting clients’ property and, ultimately, protecting the health of millions of people, both domestically and abroad. Food protection in PRW means monitoring — consistently, persistently, and unceasingly — the temperature levels and conditions of products accepted by, stored at, and sent from the warehousing facility. There are no cutting corners in PRW — not when we’re talking about food and health. A typical full-service cold-storage facility stores food products three ways — frozen, refrigerated, and conditioned (air conditioned). Conditioned warehouse space is for products, like candies & confections, that can be stored safely at ambient (room) temperatures. The cool conditioning, at no more than 65 degrees Fahrenheit at Adams Cold Storage (ACS) in Auburndale, helps to extend the products’ shelf life and preserve quality. Food products in conditioned storage are typically the most tolerant of minor temperature fluctuations. Less tolerant — much less tolerant — are the foods that require refrigeration or freezing. Keen eyes, both human and digital, are kept on these products 24/7 as they are received and stored in the warehouse. The temperature range for refrigerated storage is 33 to 40 degrees; at ACS, refrigerated storage is 33-36 degrees. A perishable refrigerated product that gets above the 40-degree mark falls into the U.S. Department of Agriculture’s “danger zone.” That’s when bacteria start to form. Some products kept refrigerated at a grocery store or in a home just aren’t meant for longer-term storage in PRW coolers. These would include highly temperature-sensitive fresh meats and seafood, some fruits & vegetables, milks and creams. These items usually go directly from the producer/packagers to the grocery stores for quicker turnover to consumers. We often consider freezing at 32 degrees F and below. For the PRW industry, it’s 0 degrees and below. At ACS, the freezers are maintained at 2 to 5 degrees below 0, and the red-flag zone for incoming frozen products is anything above 15 degrees. When a shipment of frozen food arrives with a temperature reading above 15 degrees, the ACS HACCP (Hazard Analysis and Critical Control Point) Plan kicks into action. The rule is to call the owner of the product(s) and obtain special authorization to accept or reject the shipment. Without that authorization, the frozen food doesn’t make it into the ACS freezers. That’s quality control. That’s PRW best-management practices. That’s protection — for everyone concerned. 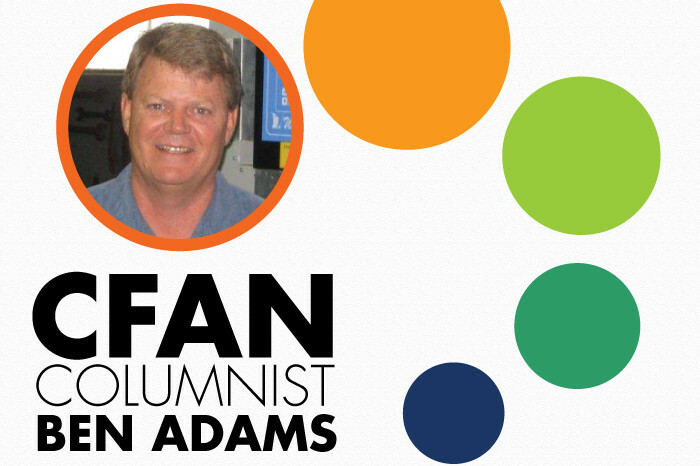 This column is sponsored by Adams Cold Storage, LLC, and the opinions expressed herein may not reflect those of CFAN or of its advertisers. Ben Adams, Jr., is an owner and president of Adams Cold Storage, LLC, in Auburndale. He has been directly involved in citrus production, warehousing and distribution, as well as state and community support, since 1980. His facility incorporates some 250,000 square feet of multitemperature warehousing, and is AA rated by BRC-International.